When life gives you a broken corner, file that shiz into a point and roll with it. I kind of love that pic. Read on for more details! This week, I'm happy to be rocking a French manicure again. I love the style, but my nails are usually too stained for me to feel OK about it, at least not without some colour-correction (hint: the purple OPI Sheer Tint polish is excellent for cancelling out yellow tones! 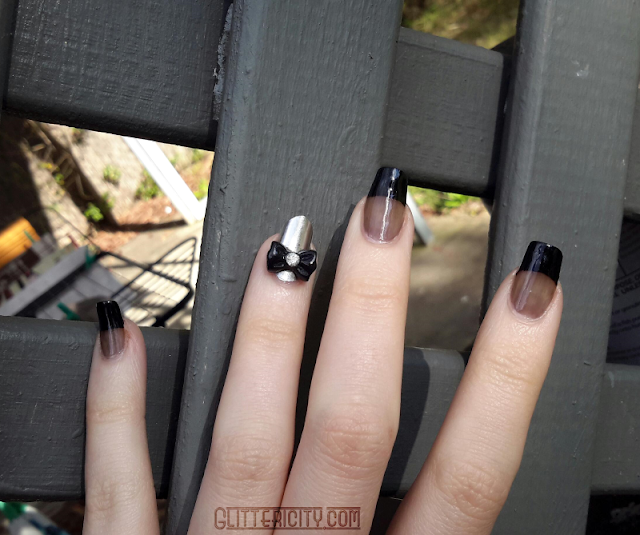 ), but due to the mini-hiatus I took recently, my nails are pretty much back to normal. 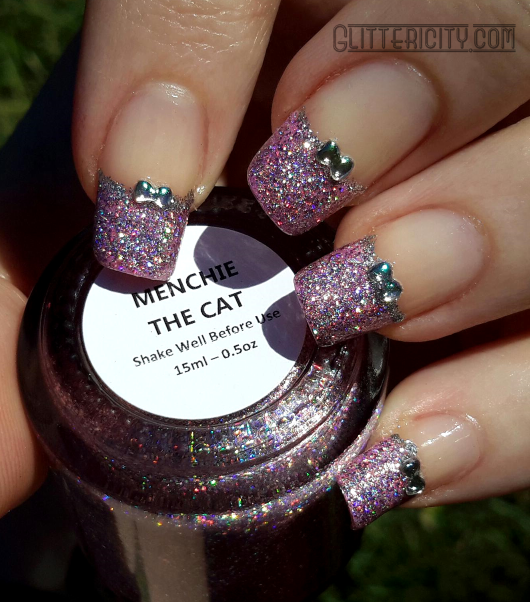 So I'm going to show you the gorgeous polish I picked up a while ago--Menchie The Cat, a collab with Starrily and Simply Nailogical! 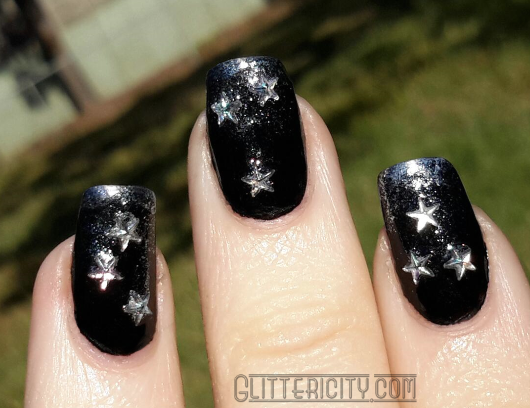 Rest is after the jump, because as is usual with my holo manis, I took waaaaay too many pics! 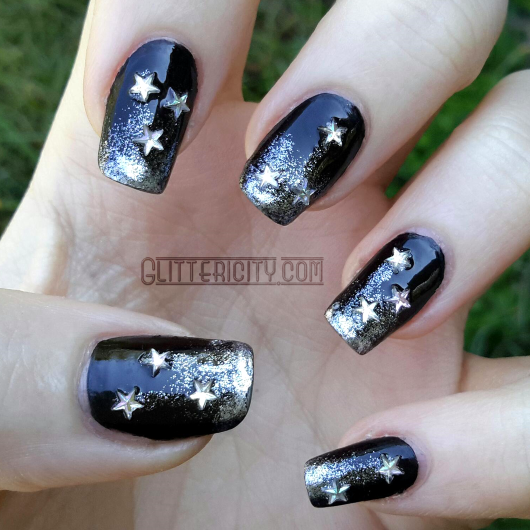 I eased back into nail art with this falling-stars gradient design over black. So, the base is just a standard single coat of Wet N' Wild Black Creme. A classic. 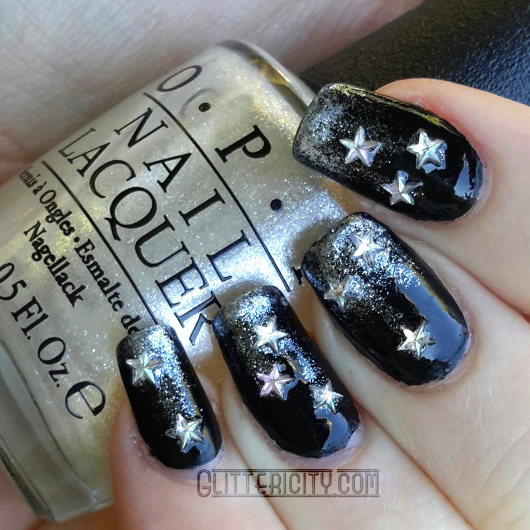 I then used my beloved L'Oreal The True Diamond, one of their Magic Topcoats, as well as OPI Happy Anniversary! 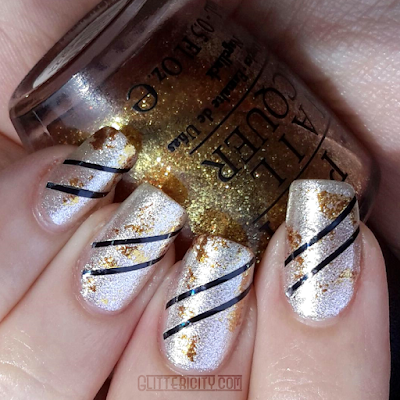 (pictured) to created a shimmery gradient on the tips. I intentionally made this a bit messy, and then used the edge of the brush to draw some lines falling down the nail towards the cuticle. The little star stones are from the same wheel as the flower-shaped ones I used recently, from Born Pretty Store. And! Possibly the best part... 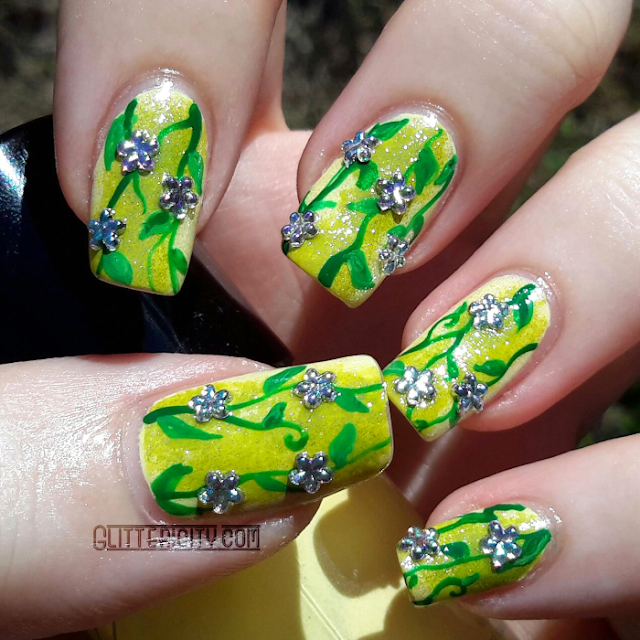 I used a relatively new-to-me topcoat, Sun Envy Gel Effect topcoat by UNT. And OMG, it's amazing. It doesn't need an LED light to cure--it just cures in natural light. I go outside in the sun so it dries faster. It's so shiny, and it doesn't damage stones, even these plastic-ish ones. Fantastic! GET IT. Greetings, polish-holics! 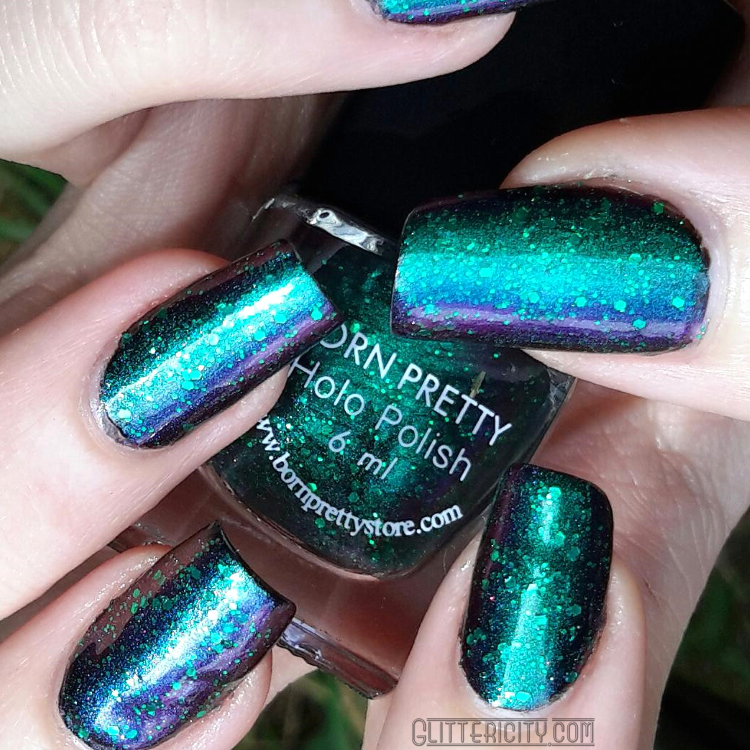 I'm back with the final review for this batch of Born Pretty Store goodies--an absolutely stunning multichrome they've called "chameleon" polish. Look at this beauty! JUST GAZE at those colours! I'm enthralled. See more details ahead! 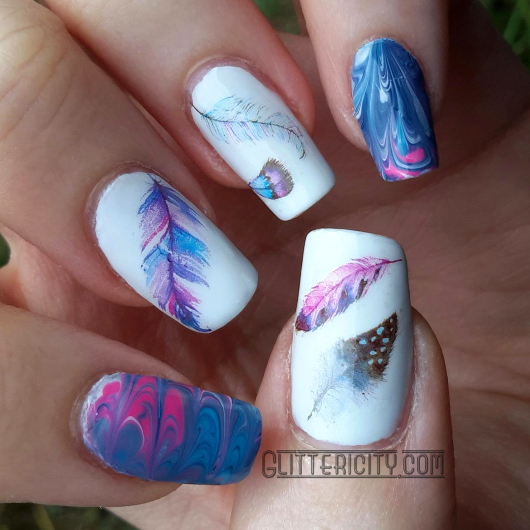 These colourful feathers were sent to me to review for you today. Verdict? They're gorgeous! Click the jump to see more! Hello! 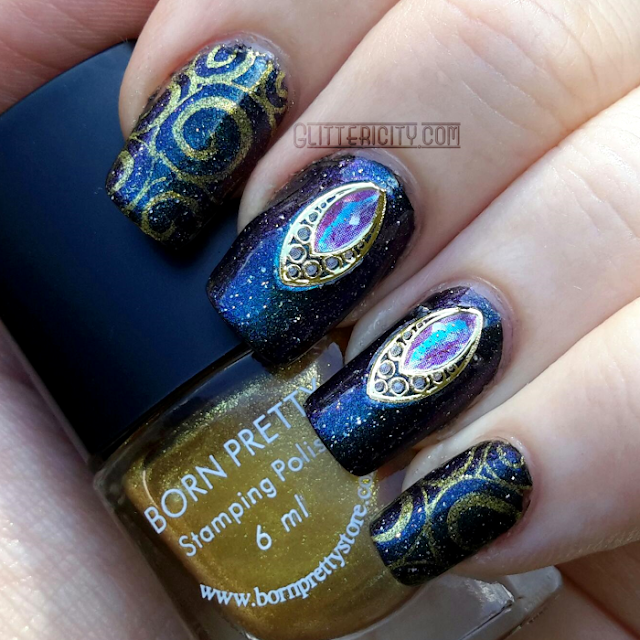 I'm back with some more Born Pretty Store goodness for you today. These gemstone decals are so gorgeous, and I had to accentuate them with some more stamping with my new love, the clear stamper.